Tech companies have been betraying our trust of late. Just picking recent examples, there was the massive Facebook hack. Then Google decided to just shut down Google+ because of a data breach. 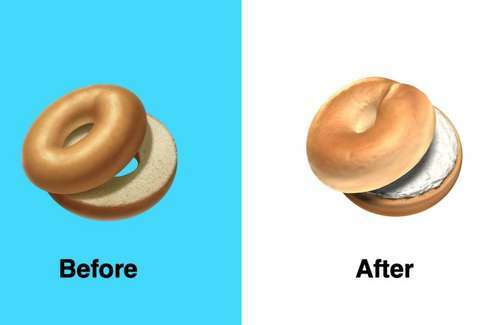 And finally, and worst of all, there was Apple's new bagel emoji. Look upon it and shudder. But there's good news: At least one of these companies is showing some accountability. This utter travesty of a bagel emoji has been fixed as of Apple's latest iOS 12.1 beta software update. If you're wondering what the problem is, look again. It's the driest bagel imaginable. It lacks even the sheen of butter, let alone a coat of cream cheese. There is just the bread, dry and barren. Naturally, there was an uproar about this. The people demanded cream cheese at least, maybe even lox. People invoked their status "as New Yorkers." Someone even tweeted that they were organizing a march. Finally, Apple listened. As Emojipedia noted, a healthy smear of cream cheese has been added to the bagel, and the wrong has been righted. It's also, you probably noticed, a handsomer bagel all around. The dough has more dimension now. Check out the other bagel emojis at Emojipedia and you'll probably agree that Apple now has the best bagel emoji of all. Let this be a lesson to other tech companies about accountability -- but, above all, to bagel-makers everywhere.